One of the daughters of Pres. 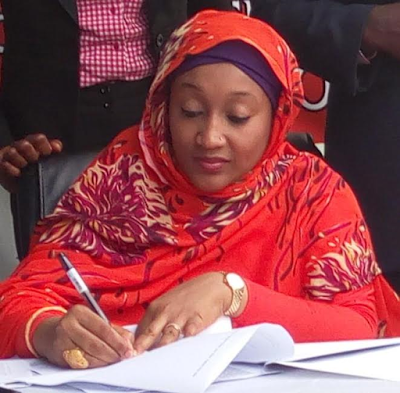 Buhari, Hadiza Buhari-Bello, has set up a fund under her Africa Support and Empowerment Initiative (AFRISEI) NGO. The NGO is working together with The Nigerian Peace Corps (PCN) on this project.She is said to have set up the fund ' to cater for the welfare of the 21 schoolgirls released by Boko Haram last week. The fund is said to have started receiving donations as the Nigeria Peace Corps has allegedly donated N3,500,000. Following repeated enquiries from the media, we stumbled upon information of an event tagged “Official Inauguration and Signing of Memorandum of Understanding (MOU) on the Chibok Girls Endowment Project” organised by the “Peace Corps of Nigeria” and “Africa Support and Empowerment Initiative”, with Hadiza Buhari-Bello. We are shocked, perplexed and completely dumbfounded to see the bold inscription of our hard-earned name, #BringBackOurGirls, on the event’s backdrop. We state categorically that we are not party to the said event and have absolutely no information of its origin. We urge the general public to disregard attempts at linking our movement to this highly suspicious event. After 902 days of painstaking advocacy, it is disheartening and unfortunate to suddenly see attempts, by external actors, to use it for selfish purposes. We have carefully built our reputation as a well-organized and disciplined global movement that is completely self-funded. The deliberate decision, to remain funded by sacrificial contributions of members for our very negligible needs, is the reason we are solely a Citizens’ Movement, and not an NGO. It will be highly injurious to allow it be dragged in the mud at this point. We therefore demand an immediate retraction and unreserved apology from the organizers. Together with our lawyers, Femi Falana & Co., we are considering a response to this attempt to smear our movement. We call on the general public and law enforcement agencies to be on the look-out for unscrupulous persons who may already be/are planning similar nefarious acts to deceive the local and international community.